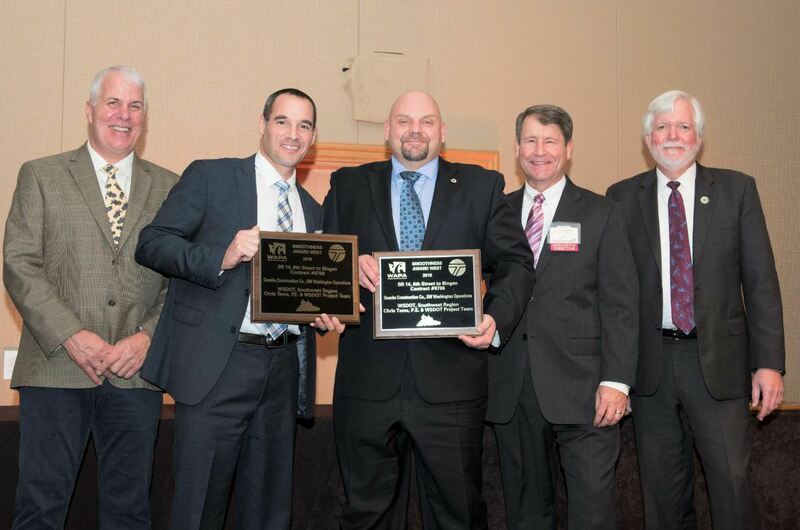 WAPA presents its annual paving awards at its annual meeting each November. Washington Asphalt Pavement Association was formed in 1954, and its regular (HMA producing) members represent 98 percent of HMA/WMA production capacity in the state. David Gent has been the association’s executive director since Jan. 1, 2016. Dave was the technical director for WAPA in the 18n months prior, after working for paving contractors for 36 years. 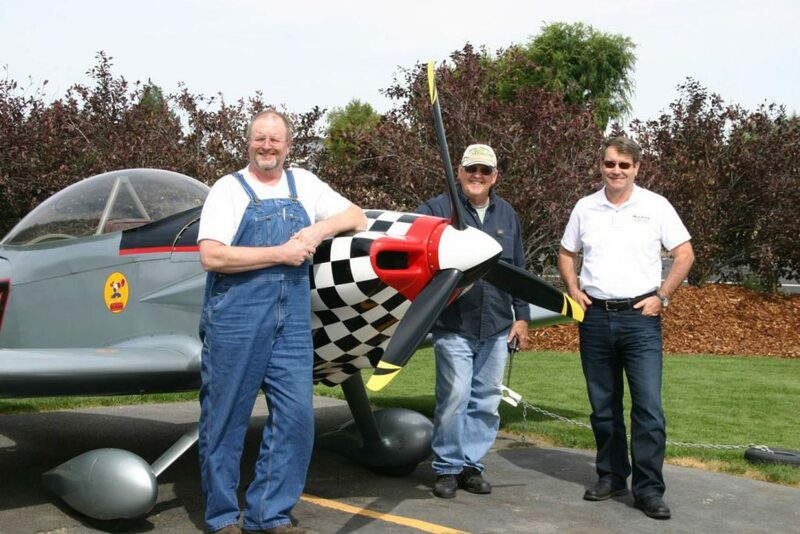 He’s been active in WAPA since 1984. WAPA has its annual meeting each November, a mid-year meeting each May, and technical conferences throughout the year. AsphaltPro spent some time getting to know Gent, WAPA and what they’re doing to promote asphalt in Washington. What are the top ways you have increased membership in the association? We try very hard to maintain good working relationships with our department of transportation (DOT) and with the associations representing city, county and consulting engineers. If you want your company involved in moving HMA paving forward within the state, WAPA provides a voice and a platform that represents professionalism and an industry-wide perspective. That is the base value of belonging to our association. WAPA also holds educational conferences across the state twice a year, one held jointly with the DOT and one targeted to consultants and other industry professionals. WAPA membership provides these training opportunities that focus on HMA and state specific HMA topics, innovations, and specification changes. Finally, WAPA has always been a lead “boots on the ground” advocate in the state legislature for increased state transportation and roadway preservation funding. WAPA interacts and educates legislators on the importance of highway and infrastructure funding from an industry-wide and statewide perspective. We are fortunate to have developed our reputation as a fair dealing association that is dedicated to continuously raising the bar for building best value roads and infrastructure. Our membership supports this mission and being a WAPA member is widely recognized as a lead indicator that your company is focused on pride and professionalism. We share our best practices and ideas with the greater SAPA community. The other SAPAs, in continuous communication, readily share with WAPA too. What is your favorite method for recruiting new asphalt professionals to the industry in general? And why? WAPA was an early proponent of endowed scholarships. We award approximately forty $1,000 scholarships to civil engineering students at the two largest state universities each year. The awarded students are chosen by key HMA knowledgeable professors within their departments. The scholarships are awarded to students that have taken construction materials classes that specifically must include a good grounding in HMA. These students receive some basic grounding in road materials science and gather an appreciation of the value of our roadway systems to our economy and society. I get to remind them that more than 93 percent of all our paved roads, nationwide, are paved with asphalt! It’s great to interact with these students and impress upon them the critical role asphalt pavements play in our daily way of life. It’s a great bonus when some of the students go on to internships and early career entry with WAPA member companies or the public works agencies we work for. 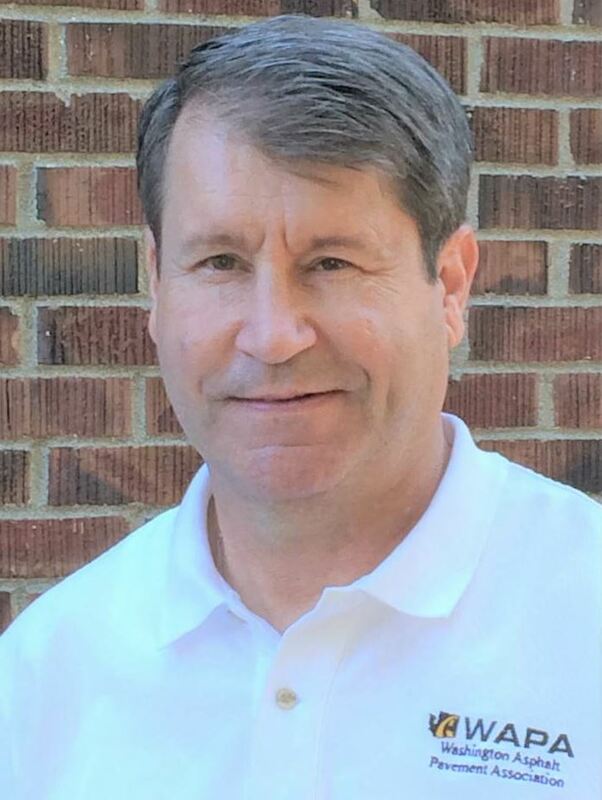 David Gent has been the Executive Director of Washington Asphalt Pavement Association since Jan. 1, 2016. About how many member asphalt projects do you visit per year/paving season? What about asphalt plant tours? Member asphalt open house events? State agency or DOT meetings? I visit approximately 50 asphalt projects each year to judge them for our annual paving awards or to view construction practices used on specific jobs. I also go on a few asphalt plant tours each year, especially when new or innovative technology is added and I attend asphalt plant open house events periodically. I participate in about 20 agency meetings with various public agencies each year, the bulk of which involve the Washington State DOT. Our APWA chapter is also proactive in maintaining and refining local agency specifications and I participate in that forum. On a scale of 1 to 5 (1 being none at all; 5 being very much), how much of a threat to your members’ market share/livelihood is the concrete industry in your state? About a 3.5. Although HMA is the proven highest value choice when calculating a life cycle cost analysis (LCCA), most importantly we consistently win the “best initial cost/speed of construction” element of the LCCA, which is key during a period of tight transportation budgets. That being the case, the concrete industry is always aggressive at marketing the attributes of its product at every opportunity. Fortunately, HMA is a very adaptive and versatile product that can adapt well to every sector of paving, from attractive bike paths to stout log sorting yards. Recently the concrete folks have been pushing roller-compacted concrete as an alternative to asphalt paving because the high initial cost and slow speed of construction of standard concrete pavements is difficult to overcome in this marketplace. Could you share an anecdote of a time when the concrete industry encroached on the asphalt marketplace in your state? There was a small roller compacted concrete (RCC) project (5,000 square yards at 7 inches thick) built in 2016 in a southwest Washington county that has been showcased at regional conferences recently. It was an interesting presentation. Of course, the true performance and long-term value of the pavement will take years to evaluate. It was interesting to me that even though the presentation intended to show the attributes of RCC as an alternative to HMA, the RCC, being shown in its very best light, was calculated to be equal in cost to an equivalent HMA section. The RCC construction was much slower and included the need for post-paving surface treatment (finishing agents, power troweling, tined surface and sawed joints). On top of that, best practices call for the use of a specialty mixing plant, a highly specialized asphalt paver and asphalt rollers to achieve compaction. We’ll let the project speak for itself over time, but in polling nationally, the small number of RCC pavements placed have not achieved the performance purported. And the best fix for poorly constructed RCC? A good structural overlay with HMA. On a scale of 1 to 5 (1 being none at all; 5 being very much), how much difficulty are your members having in finding qualified workers for their asphalt paving or production crews? 3.5. We lost field crew talent during the financial slowdown and because state highway funding had fallen behind the need. With an improving economy and a modest gas user fee increase, the market has rebounded somewhat, but is still not “red hot”. We have generally been able to field solid paving crews, but it can be difficult to manage at the height of our road building season. Better union training programs and alternative vocational educational programs have helped somewhat and, to date, our members have been able to meet the immediate need. Could you give an example of a way your state APA assists members with workforce development? We provide the training sessions I mentioned above, which cover “best practices” and “back to basics” classroom training and which is targeted generally for crew leaders, supervisors and above. We also actively promote the NAPA free webinar series, co-sponsor equipment manufacturer training opportunities and provide notices highlighting online training tools that are entering the market. Paving crew workforce development is not a core mission for WAPA at this point, but we discuss and assess the needs of our members continually. Gent visits approximately 50 asphalt projects each year to judge them for WAPA’s annual paving awards. On a scale of 1 to 5 (1 being none at all; 5 being very much), how involved are your state elected officials in transportation issues such as funding and infrastructure improvements? 3. Many state elected officials would rather not deal with the tough choices necessary for funding basic transportation and many have found it easy to be critical of the DOT, but through continuous advocacy and education our legislature seems to (eventually) find a way to increase funding when budget cliffs are looming. We are fortunate that there are always a few very well informed elected officials that understand the need and work to build a consensus for basic levels of funding. WAPA has been key in stressing the value and importance of preventative/ timely maintenance to our elected officials. It would be irresponsible to undermine the incredible investment we’ve made in the state road network by lack of sufficient funding. On a scale of 1 to 5 (1 being none at all; 5 being very much), how involved are your asphalt members in transportation issues such as funding and infrastructure improvements? 3.5. There is a core group that always “answers the call” when needed and who religiously attend the Transportation Construction Coalition Fly-In to Washington D.C. each year. Others step up in times of acute need. Many folks would rather just run their businesses and they rely on their industry association representatives to deal with these issues. WAPA generally provides this service at the state level while NAPA provides leadership at the national level. Could you share an example of a time when your state APA hosted elected officials to educate them on the need for highway funding, asphalt materials, construction workforce development, etc.? We presented transportation leaders from the State House and State Senate with “profiles in courage” awards at our annual awards banquet in 2015 when the last fuel user fee was passed. We always invite elected officials to present their outlook regarding transportation matters at our annual meeting. State and national elected officials are invited to plant site open house tours by progressive WAPA members on occasion, but these are not regularly scheduled events. How did you join the asphalt industry? I was a junior in the civil engineering department at the University of Washington the year Mt. St. Helens erupted. My family lived in a small city (Moses Lake) located in the middle of the state that was hit very hard by the ash fall from the volcano. My dad asked me to come home and help him shovel about a foot of ash off the roof of our family home. One of my favorite professors and mentors, Dr. Joe Mahoney, heard that I was heading home and asked me to bring back several 5-gallon buckets of the volcanic ash. His interest was to see if the ash had cementitious properties. His initial idea was that perhaps the ash could be easily stabilized in the short term to help with cleanup and to limit the damage being done by the fine ash blowing throughout the region. It turned out that the ash was not naturally cementitious, but I ended up working as a lab and research assistant from that point on, focusing mostly on asphalt paving research with Dr. Ron Terrel. That experience jump started my interest in asphalt paving and it has been central to my career. When I’d earned my degree, I was hired by a family-owned heavy civil contractor (Wilder Construction). HMA production and paving was a core line of the business. I began estimating and project engineering directly out of college and grew to love the ever-changing challenges presented by civil construction and roadway paving projects. I particularly enjoyed that there was always a new job or challenge quickly following each completed project. Not many civil engineering students were as exposed to asphalt technology as I was and so I found a solid niche in working on projects that nearly always had a large paving component. I loved the challenges and was able to bid and build a wide variety of projects, both in Washington State and occasionally in Alaska (bidding only). What do you see as the most important part of your job as the Executive Director of a SAPA? Promoting the value and versatility of hot mix asphalt to the public, teaching asphalt technology to a wide variety of stakeholders and freeing WAPA members to concentrate on running their businesses knowing that WAPA is out there advocating for funding and fair and practical specifications. What is the most challenging part of your job, and why do you think it’s a challenge in your state? Continuing to raise the profile of the importance that asphalt pavements play in our economy and everyday lives and trying to keep that message highlighted so that it is properly funded versus more high-profile infrastructure, like floating bridges, soft bore tunnels, car ferries, light rail, bike lanes, etc. People simply take asphalt pavements for granted, as a basic fact of everyday life. It’s hard for folks to be passionate about asphalt pavements, but without the road system, bike paths, walking trails, port facilities, etc., that make our economy efficient, our lives would be much different. What has been the most rewarding experience for you during your time as the Executive Director? Awarding the best paving awards at our annual awards banquet. Paving crew members and their foremen come to be recognized alongside public works officials and company leaders and company owners for their good work. Often, they have their spouse, or an honored guest, attend the banquet with them. These hard-working folks are handed prestigious awards by the president of the APWA or the president of the Association of County Engineers or by the chairman of the Airport Manager’s Association or even by the State Secretary of Transportation! It’s gratifying to recognize the key members of the project teams appreciation for their great efforts in a room full of folks whose work lives center on delivering great paving projects. Those normally stoic faces light up with a big smile! It never gets old to show appreciation for a job well done.